Several years ago, I did something that a lot of people who have limited success in relationships refuse to do. I backed off and spent time getting to know and love myself rather than seeking someone to do that for me. Well, those several years were actually fifteen years ago. What was supposed to be a brief self-assessment turned into a case of me practising narcissism. And truth be told, since then I have not gone to bed with grief, tears on my pillow, sleepless nights, or a diminished sense of self because I was abiding by an emotionally damaging mantra of “I am nothing without a woman.” This had marked my fifteenth year celebration. Not being one for shopping and I am going abroad mid September through mid October, I made an appointment with my ego to go to some restaurants and feast in celebration of having discovered that the world will not come to a screeching halt because I am single. 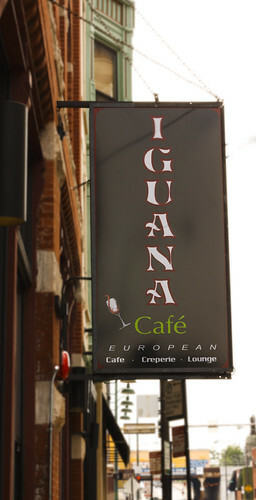 My first stop was Iguana Cafe in the River North section of Chicago at 517 N. Halsted Street. 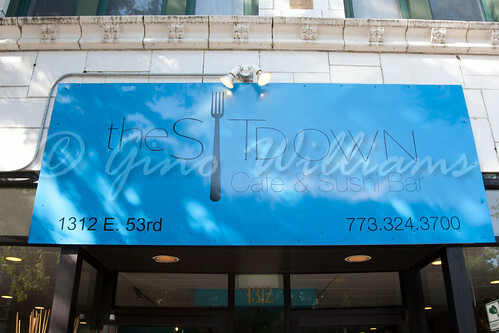 It is one of those boutique restaurants that has a coffee-house feel to it and fills up with those who have an urban chic appeal to themselves. That may be very much due to the ambience that the cafe exudes. Two very close friends had given rave reviews about Iguana Cafe, almost bordering on fanatical. So I had to see what the appeal was. On entry, one thing I found a bit disconcerting was whether to seat myself or wait. Not as though the cafe was bursting with patrons, the staff seemed rather scrambled. But I waited for a few minutes before being acknowledged and taken to a seat — where I waited for a noticeable amount of time before my order was taken. With it being morning, I scanned the extensive menu for something along the lines of breakfast fare. Usually breakfast menus leave me with a gasp, for there is so much that leaps from the pages along the lines of appetizing dishes. At Iguana Cafe, the bill of fare was somewhat pedestrian although exhaustive. 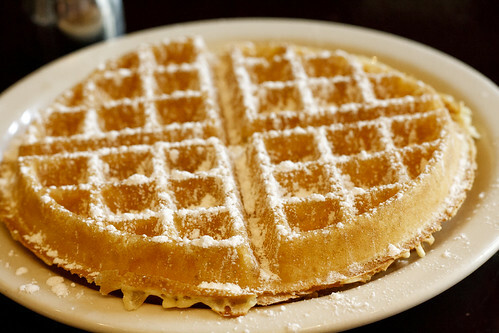 Noting that, I ordered a Belgian waffle because I was confident that the kitchen staff would not botch that. I also ordered Greek yogurt with strawberries and bananas and an iced chai to wash it all down. The Belgian waffle certainly was not a defrosted breakfast delight, as it was still crispy on the outside, warm and fluffy on the inside after I had snapped about 75 shots of it from various angles. Filling the whole plate, the taste finally made things feel okay, because the initial impression of the cafe was — shall we say — a bit run of the mill. 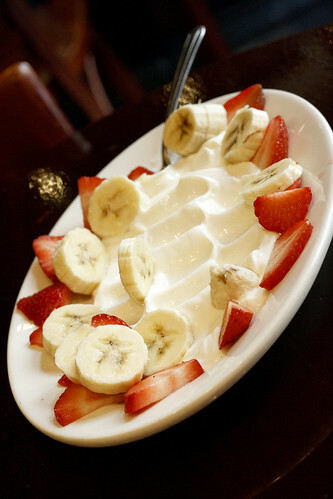 As an individual who is not a fan of yogurt from the dairy section at the local grocer, the Greek yogurt with strawberries and bananas really etched itself in my mind as a highlight. Greek yogurt alone is a bit of an acquired taste because it is not loaded with sugar, saccharine, Splenda, Equal, or high fructose corn syrup the way you find yogurt in the supermarket. The natural sweetness of the fruit was all that was needed. 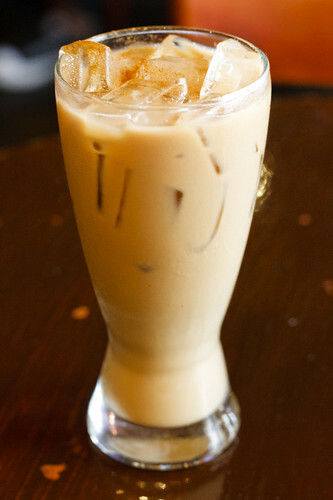 And the chai, although it may have been the quick mix in the pourable carton, was still good enough on ice to wet the throat. So, I get to say that the dining experience at Iguana Cafe was worthy. After an enjoyable breakfast, I felt as though I was at a Jamaican cafe when it came time for paying the tab. In Jamaica, you practically beg for the tab and have to push your way to the counter to pay the bill. I waited for the tab to be brought to the table — and I waited, and waited, and waited. By the third time having to request the check, I walked to the till to pay the tab. Crime. Treason. Horror. Murder. The stares I received from the staff, as if though I was supposed to sit and wait for fifteen more minutes while the time on the parking metre ran out. This is not written as a deterrent, but while the food left me with a smile, the whole customer service thing was missing from the equation. To quote the youth of the present urban setting, “It is what it is.” And as I walked out the door with a filled stomach, I checked Iguana Cafe off my list of restaurants to sample. For a refreshing beverage, I had a pinorgranate juice. This was a blend of pineapple juice, orange juice, and pomegranate juice. Oh was it tasty. 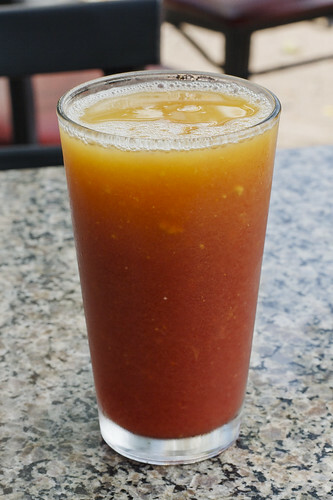 I have had pineapple and orange juice but the addition of the pomegranate juice added a hint of tartness that did some tricks on the tongue when matched with the sweetness of the other juices. Americanized Asian dishes have a love of adding sweet and sour meat-of-your-choice to their menus. The sweet and tart marriage in the glass of pinorgranate juice had given me an idea of some juicing to try at home. Not to stuff myself relentlessly, I opted for a maki roll because the rolls I had during my first visit were so outstanding that I do not think I gave the write-up justice when I did my first journal entry for The Sit Down Cafe. On this visit, I ordered a dragon roll. 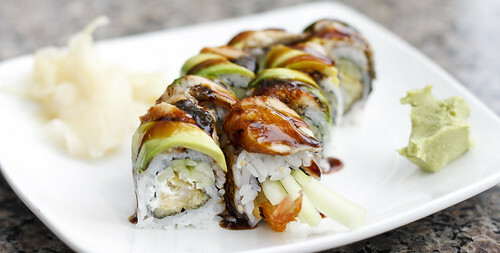 Tempura shrimp, avocado, cucumber, tobiko, and barbecued eel. 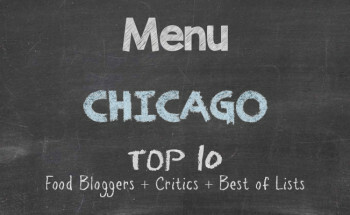 What more could you ask for in food satisfaction? Of course I could rattle off several more choices, but the dragon roll never fails and I found a bit of a perverse satisfaction watching the two mouths frown and scoff at my photography enjoyment and subsequent exaggerated sighs of bliss. I bet they won’t sit immediately next to someone else in an otherwise empty restaurant or patio again. I don’t remember having the dragon roll when I had gone the first time, so the light feast this time was virginal at The Sit Down Cafe. Although the cafe has some other fare on their menu like a few Italian dishes, they are absolute top in terms of their sushi. The waitress who had taken my order remembered me from a year ago during my first visit. Since patrons usually snap photos with their cell phones and point-and-click phones, seeing someone photograph their food from multiple angles and with up to well over 300 clicks of the camera, I guess it would be hard to forget someone who is not only passionate about their photography but who also cleans his plate. Again the loud mouths sized me up because to hear the waitress engage me in long conversation about what I do for a living if photography is not it, what I had been doing since the first visit, some of my favourite cities for specific cuisines, and some recommended restaurants in the city was not something she did with the other dining patrons. The complete converse of Iguana Cafe, I left The Sit Down Cafe feeling as though I had left a friend’s house. And as the waitress had said, I have a feeling that you’ll be back more now that you’re in Chicago more, I will indeed return for more juice and sushi on a regular basis. Towards the latter part of the day, and after having snacked on something throughout the remainder of the afternoon, I decided that I would treat myself to some ice cream. I had gone to one of my favourite neighbouring suburbs to see “Beasts of the Southern Wild” at the picture show. 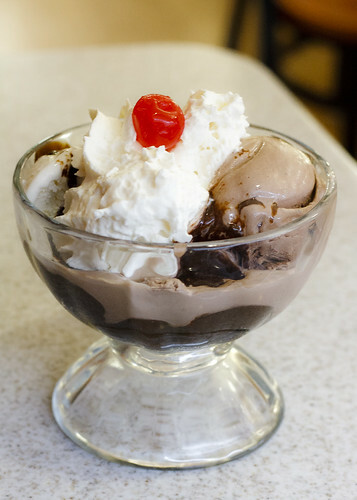 A little extra time on my hand I walked over to the Oberweis Ice Creamery at 124 N Oak Park Avenue and had a brownie sundae with a large scoop of chocolate ice cream, a scoop of cookies and cream, whipped cream and topped with a cherry. It was a perfect ending to an A+ day. After a full day of having my cell phone off so that I would have no disruption to my annual narcissism celebration, I returned home to voice mails from friends about broken hearts, divorce, and emotional torture. For some twisted reason, I smiled to myself because if I were to introduce them to the joys of narcissism, they would learn to love themselves and know the next time when someone is trying to bring trash into their homes to mess up the merry work. People take trash out for a reason. For me, if I’m not busy staring at myself in a mirror, I’m staring at my reflection in an empty plate. And I smile.